Have you noticed it seems everywhere you turn these days someone is having a baby, to me there is nothing so wonderful as another life being created. 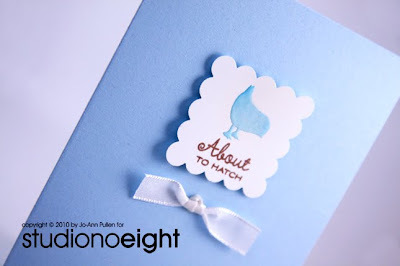 My good friend Kim (always Kimmie to me) asked me if I would like to create a baby shower invitations for her sister-in-law Nicole who is having her second child in a few months. Scott and Nicole are a wonderful couple who I have done work for in the past for their business. 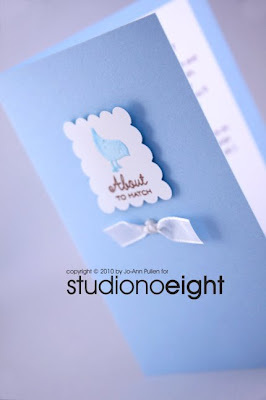 And they have been so kind as to refer me to brides who are looking for one-of-a-kind wedding invitations. So as you guessed I was only to happy to be a small part of this wonderful celebration. You all know Scott, he is a fantastic photographer not only for weddings but he also does expecting moms and little ones, each picture tells a story which makes his work truly one-a-kind. You can see Scott's fantastic work here. 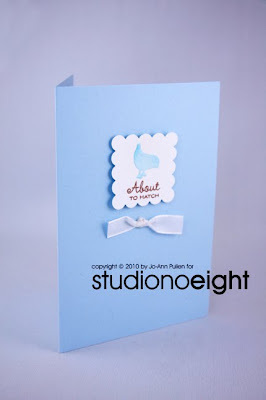 As you guessed the colour they are having a boy and though this card is simple it speaks volumes. Congratulations you two, may your life be filled with the joy that you bring to others.